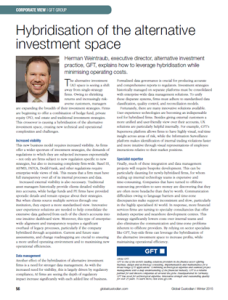 Herman Weintraub, executive director, alternative investment practice, GFT, explains how to leverage hybridisation while minimising operating costs. The alternative investment (AI) space is seeing a shift away from single-strategy firms. Owing to shrinking returns and increasingly riskaverse customers, managers are expanding the breadth of their investment strategies. Firms are beginning to offer a combination of hedge fund, private equity (PE), real estate and traditional investment strategies. This crossover is causing a hybridisation of the alternative investment space, creating new technical and operational complexities and challenges. This new business model requires increased visibility. As firms offer a wider spectrum of investment strategies, the demands of regulations to which they are subjected increases exponentially – not only are firms subject to new regulation specific to new strategies, but also to increasing complexity firm-wide. Basel III, AIFMD, FATCA, Dodd-Frank, and other regulations require enterprise-wide views of risk. This means that a firm must have full transparency over all of its internal processes and data. sporadic details and remain opaque about their strategies. But when clients source multiple services through one institution, they expect a more standardised view. Innovative user experience solutions are needed to help consolidate the extensive data gathered from each of the client’s accounts into one intuitive dashboard view. Moreover, this type of enterprisewide alignment and transparency requires a significant overhaul of legacy processes, particularly if the company hybridised through acquisition. Current and future state assessments, and change roadmapping are crucial to ensuring a more unified operating environment and to maximising new operational efficiencies. compliance; AI firms are seeing the depth of regulatory impact increase significantly with each added line of business. Formalised data governance is crucial for producing accurate and comprehensive reports to regulators. Investment strategies historically managed on separate platforms must be consolidated with enterprise-wide data management solutions. To unify these disparate systems, firms must adhere to standardised data classification, quality control, and reconciliation models. Fortunately, there are many innovative solutions available. User experience technologies are becoming an indispensable tool for hybridised firms. Besides giving external customers a more unified and user-friendly view over their accounts, UX solutions are particularly helpful internally. 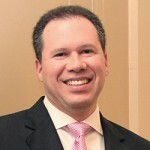 For example, GFT’s Supernova platform allows firms to have highly visual, real-time insight across areas of risk, while the Information Surveillance platform makes identification of internal trading violations faster and more intuitive through visual representations of employee interactions relative to their market positions. Finally, much of these integration and data management projects will require bespoke development. This can be particularly daunting for newly-hybridised firms, for whom scaling up internal technology teams is expensive and time-consuming. Companies that have turned to offshore outsourcing providers to save money are discovering that they are often more headache than they’re worth. Communication difficulties owing to language barriers and time-zone discrepancies make support inconsistent and slow, particularly in the highly specialised AI world. In response, more financial services firms are turning to specialty consultancies that offer industry expertise and nearshore development centres. This strategy significantly lowers costs over internal teams and also eliminates the communication and time-zone problems inherent to offshore providers. By relying on sector specialists like GFT, buy-side firms can leverage the hybridisation of the alternative investment space to increase profits, while maintaining operational efficiency. This article was originally published in Global Custodian. The PFD version can be download here.